Vision33 welcomes Meridith Baer Home as its customer. Meridith Baer is the premier home staging company in the U.S., celebrating 20 years of luxury home staging. The company has been named by Los Angeles Business Journal as one of the fastest-growing private companies four years running. 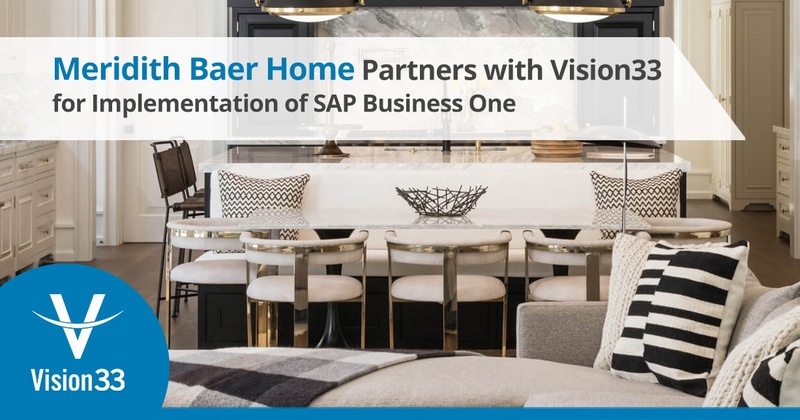 Meridith Baer recently partnered with Vision33 for the implementation of SAP Business One, an affordable enterprise resource planning (ERP) solution for small to midsized enterprises (SMEs) to streamline processes and gain greater insight into their operations. For many, a home is one of the largest purchases they’ll make in their lives. Meridith Baer has grown a successful business by removing the barrier of selling empty properties to home buyers by staging them with elegant furniture, and expert design and materials – helping the buyer better connect with the space. Homes staged by Meridith Baer will typically sell faster and for higher prices than unstaged homes. The company’s service offering also includes interior design, instant home, and luxury furniture leasing through its offices located in Los Angeles, San Francisco, Connecticut, and Pompano. What began as a passion of founder Meridith Baer, has quickly grown to become the leading luxury home staging company with clients including celebrities from well-known actors and musicians. Like many growing businesses that partner with Vision33, Meridith Baer was using QuickBooks accounting software and other applications to manage their operations. As the company expanded, adding warehouses and offices across the US, their business systems couldn’t keep pace with the fast-growth. Because they were using multiple applications, workflows required employees to access multiple systems of record, adding time and causing inefficiencies. While QuickBooks had worked well when Meridith Baer was a small business, the company had grown. They needed something more robust on the accounting side to handle their financial reporting needs and the expanded inventory and footprint of their operations. So, when it came time to upgrade their business backend, Meridith Baer chose SAP Business One, a single, integrated ERP solution that provides clear visibility into their entire business and complete control over their operations. It captures all critical business information for immediate access and use company wide. And unlike accounting software packages and spreadsheets, like QuickBooks and Microsoft Excel, it delivers what they need to manage their key business areas beyond basic accounting functionality. Meridith Baer chose Vision33 to help their fast-growth company better connect with their business backend and, in the process, create a more seamless customer experience. To the partnership, Vision33 brings a dedicated team of support consultants and a renowned customer support program, Vision33 TOTAL Care. With decades of experience, Vision33 provides the right balance of software, world-class consulting and support services to help our customers achieve their goals for growth and success through transformative technology. Meridith Baer just completed the blueprinting phase of the ERP implementation with Vision33’s team of certified SAP consultants which looks at mapping their business processes to SAP Business One, all the while tightening up existing financial processes. We wish Meridith Baer the best of luck with the implementation phase and in achieving future company growth milestones supported by SAP Business One. 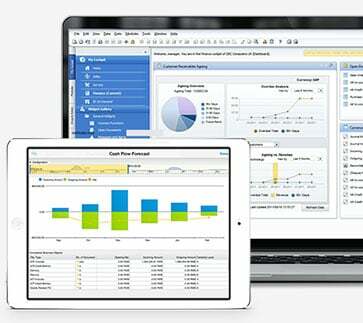 Interested in Learning More About SAP Business One? If you’re interested in learning more about what SAP Business One can do for your fast-growth company, access Vision33's SAP Business One information kit. Inside you'll find a curated selection of resources that are of benefit for any business considering moving to an integrated business management solution.